Q Acoustics introduces larger Q-TV2X for 42-50in TVs | What Hi-Fi? The Q-TV2X is available now for £349.90. 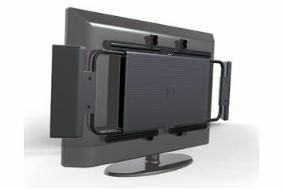 It joins the existing £329.90 Q-TV2 model, designed for 30-42in TVs. Both models use eight balanced Mode Radiator (BMR) speaker drive untis, designed to disperse sound across a much wider axis than conventional speakers. The built-in 100W subwoofer, which straps to the back of the televison, has been designed to be fully 'force cancelling', so minimising vibrations and resonances from the unit, to prevent any blurring of the picture or long-term damage to the TV. The sub is only 38mm deep. There's a spare input for iPods and MP3 players on the Q-TV2/2X, so they can be played through tthe system as well. Q Acoustics products are distributed in the UK by Armour Home Electronics.